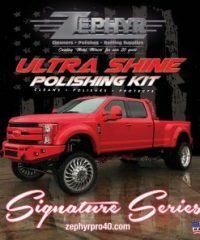 THIS KIT HAS BEEN ASSEMBLED FOR THE PURPOSE OF MINIMIZING SWIRLS AND POST-POLISHING MARKS IN ALUMINUM. THE BONNETS INCLUDED IN THE KIT FIT ARE MADE OF AN ULTRA-SOFT FLANNEL MATERIAL THAT WILL LEAVE A SWIRL-FREE FINISH. THESE BONNETS FIT SNUGLY OVER TOP OF A 6” WOOL PAD, ALSO INCLUDED IN THE KIT. THE BRIGHT WORK BLUE METAL POLISH IN THIS KIT IS A VERY FINE POLISH THAT IS PERFECTLY SUITED TO THE USE OF THE ULTRA-SOFT BONNETS. TO GET THE DESIRED RESULTS, AN ORBITAL POLISHER MUST BE USED WITH THIS KIT. 2. MOUNT THE HOOK & LOOP BACKING PLATE INCLUDED IN THE KIT TO YOUR ORBITAL POLISHER. PLACE THE 6” WOOL PAD ALSO INCLUDED IN THE KIT TO THE BACKING PLATE. 3. STRETCH THE ULTRA-SOFT BONNET OVER THE 6” PAD. NOTE: THIS WILL BE A VERY SNUG FIT, BUT SUCH IS NECESSARY TO KEEP THE BONNET FROM SPINNING OFF. 4. USING THE ORBITAL POLISHER, GO OVER THE SURFACE AREA UNTIL RELATIVELY CLEAN. 5. REMOVE THE USED BONNET FROM THE 6” WOOL PAD AND STRETCH A SECOND CLEAN ULTRA-SOFT BONNET OVER THE PAD. 6. POLISH THE SURFACE AGAIN TO REMOVE ANY REMAINING RESIDUE AND FINISH THE PROCESS. (*** DENIS OF D C SUPER SHINE PREFERS TO APPLY A SMALL AMOUNT OF POLISH DIRECTLY TO THE FLANNEL BONNET. THIS WOULD BE DONE AFTER STEP 3).